Eight jurisdictions in the U.S. currently permit medical aid-in-dying (AID), yet little is known about the direct experience of caregivers in supporting a loved one through the process. To explore the experiences of lay caregivers involved with AID in the U.S., focusing on the day of death. 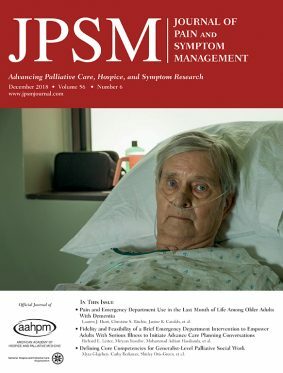 Semistructured in-depth interviews were conducted with caregivers of terminally ill patients who pursued AID under Vermont’s 2013 “Patient Choice and Control at End of Life” Act. Deidentified interview transcripts were analyzed using an inductive iterative approach. The final sample included 19 caregivers who had cared for a total of 11 patients. Most caregivers were females (89%), and more than half were close friends. Their mean age was 60.3. Social support provided by caregivers on the day of an AID death fell into two broad categories: emotional and instrumental. These overarching forms of support were further distributed between four distinct temporal phases: preparation, ingestion, waiting, and after death. Although AID is often presented as a simple matter of individual choice and autonomy, most patients who pursue it do so with tremendous support from caregivers, who are in turn deeply implicated, socially and morally, in the process. Including caregivers in education and planning, where warranted, can mitigate feelings of unpreparedness and ensure a smoother experience for everyone involved.